Those of you that work in the hospitality industry will know just how important extra touches and little considerations such as welcome trays, complimentary toiletries and local information folders can be for impressing, refreshing and even indulging your guests. It can be the smallest details that turn their positive first impression into a lasting one. Perhaps you’re not sure what your competitors provide or what your guests want, or maybe you just want to revamp your hospitality trays with something a little bit different. Whatever it may be, updating aspects of your room, including your welcome trays, is a great way to stay ahead of the game and set yourself apart from the competition. 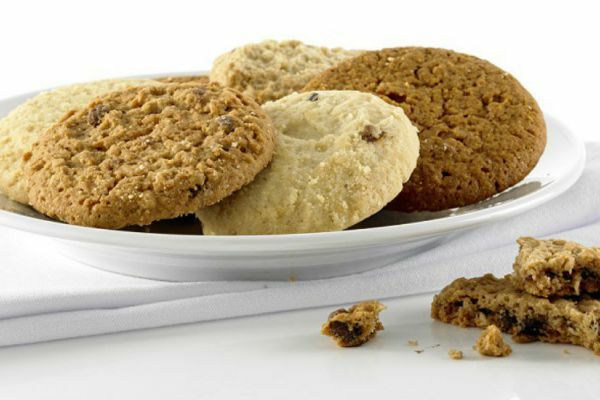 In this blog we’ll be talking you through each stage of the welcome tray – what tray is best for you, the best food & drink to provide, and some of our latest products that will really help you stand out. Choosing the tray: "I’m looking for…"
"Something to fit small spaces"
Earlier this year, we brought out a new range of Corby trays, designed entirely for the purpose to save-space, an issue raised by a number of our customers and, of course, we listened. This collection offers three tray styles: the Windermere, specially manufactured to slot into any available corner space, the Beckett tray which fits ideally on to a shelf, and the Aintree tray, designed with a square shape to be our most compact tray of the Corby collection. If you prefer to have your complimentary bits tucked away neatly into a drawer, we recommend the Acacia wooden tray. 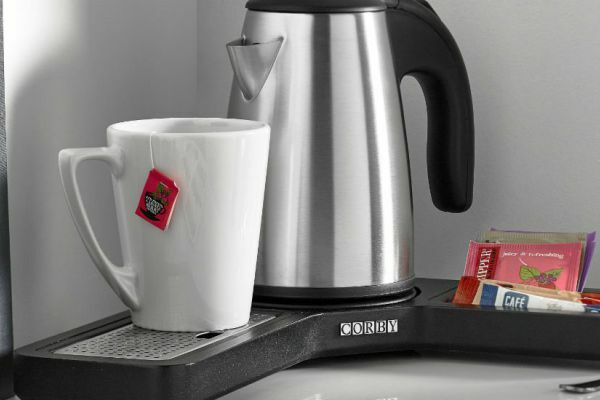 The discreet drawer compartment effectively doubles up as both a convenient storage for your sachets, with three compartments for teas, coffee and biscuits, but also ensures dust free storage (though we trust there wouldn’t be any dust in the first place!) 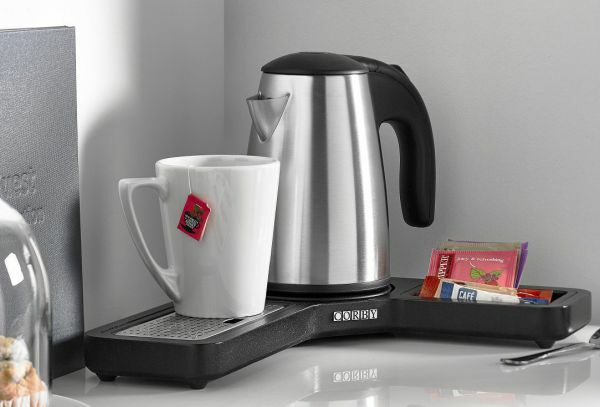 The above surface fits a kettle and 2 mugs, giving a smarter look and finish. If you’re looking for something all-white or all-black to match your décor or keep things consistent, our Eden trays are the perfect choice for you. 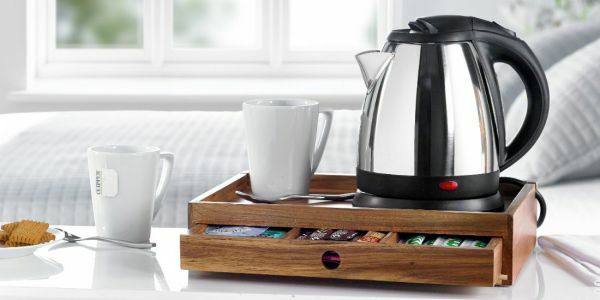 Co-ordinating perfectly with the Eden kettle, service tray and sachet holder, these minimal-looking welcome trays are also the most affordable of our welcome trays. If you want to view our full range of welcome trays, you can find them here. Adding a little sweet treat to your welcome trays will certainly lift your guests’ spirits and give them that much-needed boost after a long journey or a busy day of sightseeing. 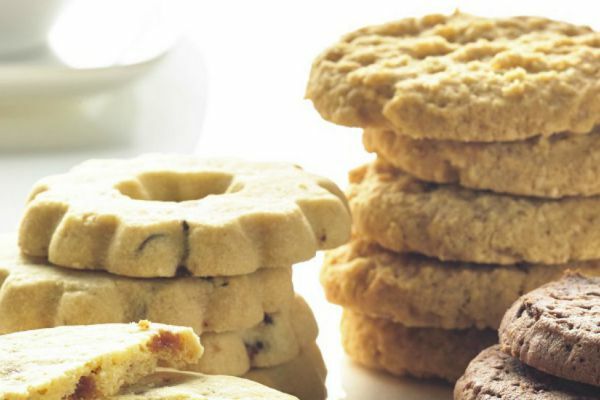 Biscuits are always a firm favourite and a staple to any welcome tray. 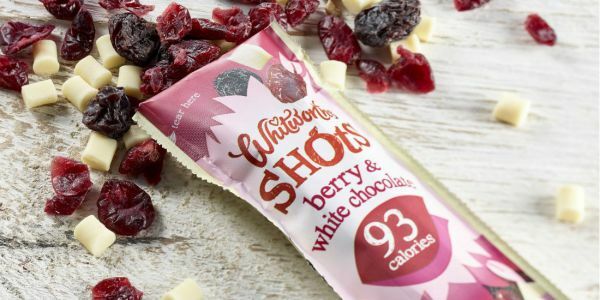 However, if you’re looking to add something a little bit different, though, we recommend the new Whitworths shots, a delectable mixture of juicy dried fruit, tasty nuts and indulgent toffee and chocolate pieces. Not only are they a great, healthy alternative to other sweet treat options at less than 100 calories a packet, they come in 6 exciting flavours to please every guest. 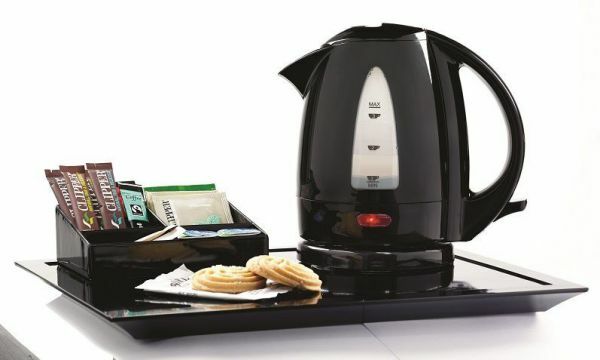 What would a welcome tray be without tea and coffee?! 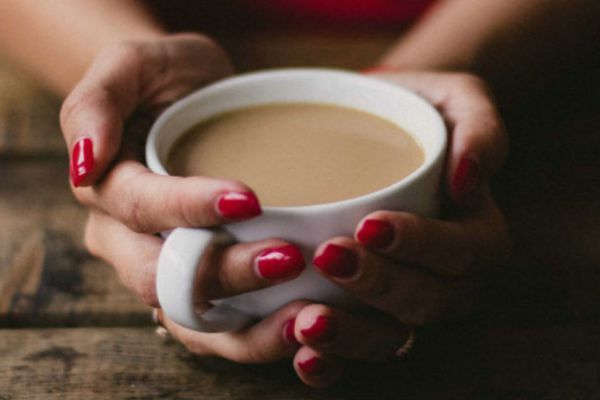 These staples are ideal as a perfect pick-me-up for an early morning brew or as soon as your guests arrive. Not only that, consumables are a great way to showcase your establishment’s values. Clipper teabags are tasty, British and Fairtrade, while the Café Express range is entirely Fairtrade, too. For guest’s eager for a colder beverage, and something a bit more exciting than tap water, Squash Stix are your answer. Available in two flavours: Apple & Blackcurrant and Orange, added to 200ml of water they quickly make a low-calorie, refreshing cold drink alternative to tea and coffee. Do you ever find yourself wondering what your competitors are up to? It would be rather nice to know, not least because it would help you gauge how your overall offering compares in terms of quality and value.